Smart Grid Market size will surpass USD 70 Billion by 2024, as reported in the latest study by Global Market Insights, Inc. Ambitious government led plans toward grid modernization will drive the smart grid market size. Major countries have enforced regulations and mandates to reinforce smart grid deployments and R&D activities as a part of their energy conservation initiatives. In 2016, global investments in digital electricity infrastructure reached over USD 45 billion to enhance the resiliency, reliability, and security of the grid. Increasing government focus toward grid restructuring to mitigate integration challenges, overutilization, and load mismatch will further boost the industry growth. The U.S. industry was estimated over USD 3 billion in 2017. Frequent blackouts and the incessant need for energy conservation will augment the industry landscape. Implementation of grid automation programs to reinforce communication flexibility and distributed intelligence of the national power infrastructure will further fuel the industry growth. For instance, the Public Service Electric and Gas Company (PSE&G) invested USD 69 million in 2017 to boost consumer energy efficiency through smart thermostat and residential data analytics programs. UK market will witness growth on account of supportive regulatory frameworks pertaining to energy conservation and environmental sustainability. The mandated nationwide rollouts and legislative directives toward smart meters will further fuel the industry growth. The Energy Networks Association (ENA) plans to implement a local energy market as part of their smart grid plan that would allow business and households to trade electricity, thereby supporting energy conservation. China smart grid market is set to expand over 11% by 2024. Introduction of government initiatives to increase the share of renewables in the existing generation mix and develop green infrastructure will fuel the business growth. The government aims at increasing the share of renewables in the existing generation mix to 15% by 2020 and 20% by 2030. Growing investments toward grid digitalization through the implementation of advanced communication technologies will foster the market growth. Growing focus toward renewable grid integration coupled with intensifying need to upgrade ageing electricity infrastructure will further facilitate the large-scale deployment of these grids. 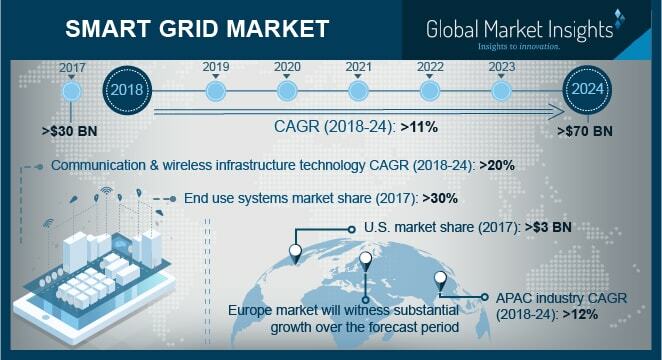 Key industry participants in the smart grid market include Hubbell, ABB, Schneider Electric, General Electric, Fujitsu General, Belden, Oracle Itron, Landis+Gyr, Cisco, Siemens, IBM, Honeywell Elster, Wipro.